Announcer: This is Point of Inquiry from Monday, February 28th, 2011. Chris: Welcome to Point on Inquiry. I'm Chris Mooney. Point of Inquiry is the radio show and podcast of the Center for Inquiry, a think tank advancing reason, science and secular values in public affairs and at the grassroots. This week's guest needs no introduction. He is Neil deGrasse Tyson, one of our most famous public communicators of science. Dr. Tyson is the Director of the Hayden Planetarium at the American Museum of Natural History and the host of PBS's NOVA ScienceNow, which just completed a new season. He is also the author of nine books, including the New York Times best-selling Death by Black Hole and Other Cosmic Quandaries, and most recently The Pluto Files: The Rise and Fall of America's Favorite Planet. Neil deGrasse Tyson, welcome to Point of Inquiry. Neil: Thanks for having me back, I think it’s my fifth time or something. Don’t you have enough of me, do you think? Chris: No, I'm not sure that we have. It's an honor to have you again. You just completed a new season of PBS's NOVA ScienceNow centered around the six big questions, some of them were, how does the brain work, how smart are animals? I guess I want to ask you first, what did you learn in the process of doing this series that may have surprised you, struck you? Neil: You asked a great question because of course professionally I'm an astrophysicist, but if I host a show on general science, I'm exposed to fields that there would be no other occasion for me to know about. I would say among my favorite subjects were the one way to try to grow human organs in a hospital in Boston. That was just creepy, freaky, amazing and astonishing where you take an organ from a pig, for example, if the pig is large enough, the organs are about the same size of what you find in humans. Then you dissolve away, take your heart for example, you dissolve away all of the pig's cells that are attached to the scaffolding that's the structure of the heart itself. Then you have this sort of this collagen ghost like structure that had contained all of the pig's cells that made it a heart. Then you grow, you culture your own cells onto that architecture, and then you implant that organ into your own body, and your body doesn't reject it, it thinks it's is its own, it's the right size. It pumps the way it's supposed to. It could be liver, it could be lungs. The idea of it that you would just grow your own organs for some later emergency, for me was the best, the future right there, and forget this plastic inserts and all these other non-organic helpers that can be installed in our body. That one I think left me in a new place. I'd say another segment that was particularly intriguing to me was the one that has just aired, but of course you can see it online, all these segments are available on the NOVA ScienceNow website. It's in the answer to, what's the next big thing. We selected the efforts to modernize the electrical grid in America. Normally when people think of big things, they think of a single big thing and they look at it and touch it. Whereas the electrical grid is more subtle than that of course, and it's so much if we take for granted. You just walk in your home and flick on a switch and all the lights turn on, where the electricity come from, how did it get there, was it efficient, how did they know how much to send? We have an electrical grid that's 70, 80 years old, and it's time to modernize it and make it work with the efficiencies that we know and expect for any kind of modern use of electricity. To watch what the grid had been doing and what it will be doing, that was new for me as well. Chris: These are both great topics. The first is under the heading of "Can we live forever?" The second would be about modernizing electricity. On the second, I'm actually interested there has been a recent story in the New York Times about how people are actually resisting smart grids because they're afraid that it's going to do something strange to their brains. Neil: Yeah. This is part of … It's not the first time people would fear a new technology. It's unfortunate. What do you do? Do you say, no, it's not going to affect your brain or you just educate them properly in the first place? And my tact as a scientist and as an educator, from my earliest days has been to really try to get people to understand the causes and effects of things and the operations of nature at its most basic level, so that when they're confronted with a fear factor, it's really ignorance. The consequence of ignorance is, you make decisions that you think are informed, but in fact are not. Whereas, if you're trained and understand then whatever subsequent decisions you make are based or anchored in a physical reality, and that's the kind of state of mind we need the electorate to be in. Chris: You also did … One of them was about how the brain works? How does the brain work? You point out that it works in part by deluding us, even by deluding us with cognitive and precognitive biases. The crazy thing is you could argue that this is sort of functional because that's how we got here. Neil: Yes. That's an interesting point, because I think science exists in part. in large measure, because the data taking faculties of the human body are faulty. What science does as an enterprise is provide ways to get data, acquire data from the natural world that don't have to filter through your senses. This ensures or at least minimizes as far as possible, the capacity of your brain to fool itself. To the neuroscientist, the brain is this amazing organ. To the physical scientist, it's like, "Get it out of here. Leave it at home. Just bring your box, and have the box make the measurements." That's an interesting duality. You have a brain, you can survive. My favorite among these is how easily the brain recognizes patterns even when there are no patterns there. You can statistically show there are no patterns, but your brain creates patterns. The long-term explanation for that has always been it's better to think that's a tiger in the bushes and then run away from it and have it not be a tiger, then for it to be a tiger, and not know it's there and then you get eaten. The people who did not see patterns in the history of the species got eaten by creatures that were in fact making patterns in the visual din of the forest. Chris: The birth of science is of course the attempt to override this. Francis Bacon talked about the Idols of the mind, and that's essentially what we're now understanding through neuroscience, but it suggests something about human nature where scientific thinking is always going to be kind of the kid who gets left out of the group. Neil: Yeah. Science, if it were natural to think scientifically then, science as we currently practice it would have been going on for thousands of years, but it hasn't. It's relatively late in the activities of culture. Science as we now practice it and that would be hypothesis and experiment, the careful taking of data. This is relatively modern. That's been going on for no more than about 400 years. You look at how long civilizations have been around. You say well, there is a disconnect there. Clearly, it's not natural to think this way. Otherwise we'd have been doing it from the beginning. Meanwhile mathematics is the language of the universe, fascinatingly so, and yet science and math tend to be the two subjects that you'll commonly hear people complain about in their time in school. I'm remaining perennially intrigued by that fact that the operations of the universe can be understood through your fluency in math and science, and it's math and science that get people to greatest challenges in the school system. That's an interesting disconnect. It calls for a greater attention to science education and science funding. All the things that will help us bridge that gap between the failures of the human mind to interpret reality and the methods and tools that enable it. Chris: Well, that's a good way to shift, there are some points about public policy that I know you have spoken about. We are in a pretty perilous situation these days when it comes to federal funding of science pretty much across the board. I know you have advocated the idea that you have to fund all strands of research, because you don't know where any one of them is going to lead. Could you explain why that's the case, and how would you apply it to the science budget situation that we're looking at? Neil: Yeah. Thanks for following up on that because there are some various YouTube clips with me. The funny thing about YouTube, because I don't post any of it, what happens is people, they bring in their camcorder or whatever and they film the whole lecture and then they take out the best parts. My best stuff is on YouTube, and if you missed out all the boring part that they didn't put up or the rest of it that flushes out the argument. This is a great occasion for me to make that clear. The urge is for people to say, "Why are we funding that when we should be funding this? Why are we going into space when we haven't cured cancer yet? Let's put money to cure cancer, and so let's fund this cancer research. Let's fund this research on AIDS or this other disease." The urge is to guide scientific efforts towards the direct solutions to problems that involve society. That urge is fully understandable, right? I'm not faulting anybody for feeling that way. But I will fault people for believing that that's the only way you'd get those solutions or that is even the best way to get those solutions. Again, I'm not faulting you for feeling that way. If you actually analyze the history of discovery and how those discoveries have influenced society, those are not the best ways to arrive at those solutions, which is not. What you end up doing is you create band aids to the problems. You get a temporary solution. It makes it feel a little better. But the profound solutions to the greatest ailments that have ever befallen society have hardly ever come from a direct application of intellectual effort to that problem. Period. The sooner people recognize this, the better. I can give my favorite examples here, if you walk through a hospital, any large busy hospital and look at every machine with an on/off switch brought into the service of diagnosing the condition of the human body. It's based on a principle of physics discovered by a physicist, who had no interest in medicine. Period. Rather medicine was not what drove the discovery that led to the creation of that medical device. One of the best examples here is the MRI, the Magnetic Resonance Imager, here it is imaging the soft tissue of your body without having to cut you open. Awesome. Where did that come from? That comes from the physical principle of nuclear magnetic resonance. Well, you can't use the nuclear word, the N word in a hospital because it will scare people. They took out the N. It's not NMRI, it's M as in MRI in the hospital. It's principles of nuclear magnetic resonance, which was discovered by a physicist who happened to be my physics professor in college by the way, discovered by a physicist interested in the behavior of nuclei and atoms in the galaxy, in the galaxy. He discovers that nuclei will respond to a magnetic field, a strong magnetic field if you pass across it, and different mass nuclei will respond differently, so that if you pass a magnetic field across this mixture of atoms and then send light across it, particular kinds of radio waves, the light will bend and be affected by those different nuclei in different ways. If you're clever about it, you can create an imager that will show one level kind of soft tissue versus another. That's what became this medical imaging device that diagnose people's conditions and saved people's live, how do you put a value on that? You can't. Lives are being saved daily from this application of the efforts of a physicist. When Wilhelm Roentgen was exploring high-energy radiation and discovers X-rays, all right? His goal was not to create a new medical device. Its application was obvious at the time. People put hand in front the rays and the other side you sees his bones. Imagine the first time you ever see that. It's like "Wow, this thing is seeing through me." Its medical application was obvious at the time. That's now what drove him, he was a physicist. When Einstein wrote down the first equations that would later enable a laser, Einstein is not saying, "Barcodes, yeah, that's what this will do?" He is not saying this. I can go on and on and on, but you only have a 30 minute show. My point is, if you want deep solutions to problems, you feel all frontiers and then you find ways to cross pollinate those frontiers. That's where the great solutions come from. Chris: Well, I know, it seems like President Obama agrees with you. He has been talking a lot lately about competitiveness and science. You have written it in America, I'm quoting you. “Contrary to our self-image, we are no longer leaders, but simply players. We moved backwards by just standing still.” How do you encourage the kind of situation in which those giant leaps forward are going to be more likely to happen? Neil: Yes. I think its two prongs … its three prongs. One of those prongs people think should be bigger than I think it should be. People say, "Well, we need better science teachers," and that will solve the problem. No, better science teachers makes a scientifically literate public. That's a good thing. Yes, you want a scientifically literate electorate. That's what a good science teacher will do for you. That doesn't make scientists. What makes scientists are people who … yes, a flame is lit within them from a teacher for sure. At the end of the day, they have got to land somewhere at the end of their educational pipeline. There has to be interesting science for them to do to continue to attract their interest beyond the semester where they had the great science teacher. When you think of the 1960s, we were going to the moon. The moon created a … the Apollo program created a zeitgeist in the country where science was seen as a way to take us into the future. Once that attitude descends on a culture, it affects everything. It affects what you want to be when you grow up. It affects how government monies are spent. It affects how people treat the field of science, are you hostile to it or are you receptive to it? It affects the entire attitude. I see NASA in itself a force of nature, a way to shape a nation's vision of itself. Because of the visibility of the agency, a single dollar spent there pays huge dividends in terms of people's awareness of what science can achieve. The three prongs are, yes, you need to do the teachers, but that's necessary, but insufficient. Then, you want to fund agencies like the National Science Foundation and the National Institutes for Health. These are agencies that fund pure, curiosity-driven science, especially the National Science Foundation. Fine, but kids have never heard of these agencies. They are not … there is no eight grader who says, "When I grow up, I want to be an NIH researcher." You don't find that typically. Now, you need a visible force that can seduce an entire generations of people into fields that will ultimately reshape the future. Like I said, I see NASA as practically unique force in that realm. I said there are three prongs, the teachers, the actual agencies that fund curiosity-driven research, and then the vision statement. The vision statement comes from saying we're going to Mars, we're going to land on an asteroid, we're going to understand the nature of the universe, all three of these together I think is the one, two, three punch that can take us out of our doldrums and put us back in the leadership role that so many of us took for granted in the 20th century. Chris: Well, that does seem like a very good recipe for zeitgeist as you put it before, although I guess some would argue, this is the thought that I was prompted to have, while you were speaking some would argue that there is a fourth ingredient that we don't have and that's the problem. That is that we were really afraid of the Soviet Union back then. Neil: Yes. What we do is … Yes, so we went to the moon because of war. War, that's correct. You have to ask … there was the cold war zeitgeist. That was the landscape on which the rest of the zeitgeist unfolded, no doubt about it. You don't want war to be why you do science, but of course it is one of the greatest drivers of scientific innovation ever. We shouldn't sweep that fact under the rug. It's just a reality of being human in this world. You don't want that to be the driver, because that's … you want something more noble. There are plenty of noble ways to do this. Among them is how about simply national security. For example, suppose there is some bioterrorism. Do you call the marines? No. What good are they? You want the best people who could have been biologist, to be biologist at your arms reach. The only way you do that is … Well, the best way I know how is in the school system you have really interesting biology frontiers to attract the next generation into. Who do you turn to again? NASA? Oh, we are looking for life in the sub … ice oceans of Jupiter's moon, Europa, who is going to help us find life. I'm going to get the very best students in that class to join that bandwagon. I'll have the best biologist, the best chemist, the best geologist, the best aerospace engineers, because they're going to be designing an airfoil to fly the rarified atmosphere of Mars rather than me saying, "Who wants to be aerospace engineer?" then, “design a airplane that's 10 percent more fuel efficient than your last generation's fleet of planes.” One will get them, the other will not at that age. I'm convinced of this. So, it maybe that the future of security as well as cyber security is going to rely on having the best possible students to become the best possible scientists in each of these fields. They'll come when called. They came when the Manhattan Project was to build the bomb. The physicist were there fully employed in the laboratories and nearly all of them came when asked. It may be that security in the future is all about how many scientists you have in your silo and not how many bombs are there. Chris: Another thing that came out of this incredible period of zeitgeist follows Sputnik and space race and then subsequent missions by NASA was one great science communicator Carl Sagan, who popularized all of this through the 70s and 80s. It has been said in many ways you are his descendent, I think that's true. I'd have to ask though, what do you think he would say about our state of scientific awareness, literacy engagement in this sort of decade, two decades plus? Neil: Okay, a couple of things. Thanks for that reference there. I'd say … I'd word it a little differently. I'd say not that I'm his descendant. I'd say that first he was essentially unique in what he created as a science, as an enterprise where exposing the public to the joys and the beauties and the frontiers of science. At the time it was unique. There were very few TV channels. Everybody watched Johnny Carson at night. The singularity of his impact on that enterprise will never be equaled. Again, that's first. Second, he carved open an entire swath through the brush and the bramble of what is required to bring science to the public. Yes, I'm in a his footsteps, so are dozens of other people, there is Brian Cox over in England, there is Michio Kaku, there is Phil Plait. Many of these people you surely have had on your show. He created room enough for many of us. That's a really good and important fact that I think is not widely enough recognized. In his day, you could channel surf for weeks, and maybe you will find Marlin Perkins, the Mutual Omaha animal show or Jacque Cousteau perhaps, but that was it. There is no other science programming on television, not in the 60s and 70s maybe NOVA, the PBS NOVA had just been born in the early 70, that's it. Today, you can channel surf anytime of day, and you can channel surf long enough, you're going to hit a science program. There are entire networks given unto science, I can only celebrate the level of access that people have to learning about science in modern times. What would Carl Sagan say? I don't know for sure. I think he would celebrate all these venues for receiving science. I think he'd have been disappointed by the level of science resentment that exists among some politicians, among some elements of our culture. It's the kind of anti-science attitude that prevail, or some of it is a fear of science, some of it is they don't like science because it conflicts with their philosophies. I think he will be disturbed by that, but would simultaneously celebrate how much access people had on an unprecedented level. Chris: Well, I think that definitely if you're interested in science and you want to go find it, there is so many places as you said to do it and we should celebrate that proliferation on all these flowers blooming. At the same time this blessing is a bit of a curse because if you aren't interested, you don't ever have to see it? Neil: Yes, I guess so. That would have been true at any time. The real variable here is that those who want to learn science in a previous era would have to go months or years before their first encounter or their next encounter, whereas today they go hours. Yeah, the issue is not the people who would have never lifted a finger then or now, it's those who wanted to lift a finger and didn't have a way to do it. I think that's where we really need to celebrate. By the way, if I were to follow-up on your point about the blessing and the curse, if I were to think about the curse aspect of this. It's given that there are so many outlets for people to convey information. It has multiplied the outlets of misinformation as well. A person can … Here is an interesting fact about a Google search of any web search engine of course. If you believe something is true and you type it in, you'll find the websites that agree with your belief whether or not the belief is actually true. You can reaffirm your thoughts simply by finding some document somewhere have also says what you think, and so that the error checking has been compromised. With the … How many billion web pages there or how many blogs there are? We have to be a little more vigilant about our capacity to edit what we see and to filter what we see judging what is the ravings of a mad man or crazy people, and whether the … and what content is secured in its foundation? Chris: Absolutely. I think that's what I was getting at, because you can have blogs that explains science really well and you can have blogs that attack science and the latter might be very popular. In fact, I wrote in my book Unscientific America that the winner of the 2008 best blog award was the blog that attacks the science of global warming, that's science blog award because it was popular. That's the problem with the information environment I guess. It's a different one for scientist to communicate in the one in which Sagan existed. We're training all sorts of scientists to communicate now, that's a major new trend. Neil: That's a new trend. It's training without the stigma that once existed for a scientist reaching out to the public. I think that there is blood on the tracks from Carl Sagan having done that first. I'm fortunate that he was in the field of my choice where I can do it now, and we have that legacy where- not that my activities accrue to my professional standing, they don't subtract from it. That's an important step forward compared to what was once the case. Chris: What advice would you give to a young scientist today who wants to reach out to the broader public not really sure how to do so? Neil: Yes. It's not a predetermined path that you can say, yes, here is what I will do and here is how … look at for example, Phil Plait. Phil Plait is the professional astrophysicist and then he had a blog and the blog became a book. Then the book, lot of interest in the book, and then he saw the need to … for skepticism to be addressed in society and then he became a big part of that movement. You don't prescript that, it's hard to prescript it. You don't … my career path, you just don't prescript it. You do what you do best and what you like the most, and you figure out along the way how that best fits into the opportunities of culture and a greater society. In graduate school I wrote a question and answer column for StarDate magazine out of the University of Texas. That became a book. Then we have the book and TV shows want your views on things. One thing leads to another, but in all cases the common denominator is that it starts out by writing. My advice to someone who wanted to be a science communicator is, you write. Writing is the excuse you can give yourself to organize ideas in coherent sentences in ways that make sense not only word to word, but sentence to sentence, paragraph to paragraph. That is the art of communication being clear and succinct. The proving ground for that is writing today. Blog, if you got a popular blog, you can gain some weight in that way. Then, in an earlier day I would have said you write Op-Ed, and letters to the editor. Well, it gets your name out there with your point of view that others might not have, but regardless it’s writing. Initially you're not paid for the writing. You are just writing because you cannot write or because the urge is so strong you just have to. Then eventually people take notice. If you say interesting things and you say them well or humorously or perceptively. Then others take notice of it, and then one thing leads to another. You can't prescript it, you just have to do what feels right and express what inspires you. Then watch where the chips fall at that point. Chris: That is really a great advice. I have watched Phil Plait's meteoric rise and glad that we did have him on the show. He is one of our most popular guests and he is a very good one. Neil: He even had a TV show. Here I am, I got my TV, I'm hosting a TV show on NOVA. What a luxury to live in a time where that's not even the only scientist hosting a TV show. Right? You can count … just count them. Just go on down the list. He didn't start out, when he is writing his PhD he wasn’t saying to himself “When I am going to host a TV show?” He might have thought about it, but that's not what's driving him. That's not what's … so I am charmed by the entire enterprise. There is some headway. I'll give a quick example here. What got a lot of attention in the last couple of weeks, if you are in the right circles, was Bill O'Riley commenting that nobody can explain how the tides come in and out and why the sun rises and sets. It was sort of a back handed reference to the power of God, and the inability of humans to understand all of gods creation. Stephen Colbert decided to poke fun at this, and invited me to do a quick little skit with him where he plays back the clip of O'Riley saying that no one understands how the tides could come in. Colbert says, "So, no one understands, only God understands,” and then I knock on the door. I come in, I say, “I understand how tides come in." It was a cute little skit, but what's interesting is it might have been a day in the not too recent past where Bill O'Riley's comment would not … that it would have gone uncontested, whereas his comments are now being contested by an active, energized resistance movement if you will. There is a movement of scientifically literate people in the population themselves not necessarily scientists who are no longer standing for this level of profound ignorance among people in power. If you have a talk show and you have the $10 m paycheck you are in power as is true with Bill O'Riley. The fact that these are … the tolerance for that level of ignorance is dropping. That resistance goes on and continues. I think that's a consequence of the widespread access that people have to sources of rational thinking, and I only see that continuing. Neil: Yes, exactly. I have been on Colbert eight times. Well, that's a big number. I think is the most of any one guest. Two interesting points, it's interesting that I, his most invited guest, I'm a scientist, point one, and it’s not a science show. Point two; I'm not the only scientist. Every week there are scientists on the show. It's not like I am even unusual in the fact that I'm on his show as a scientist. These are all indicators that I think need to be celebrated. It gives me hope for the future of the country in ways that I don't think I had that level of hope even just a few years ago. Chris: You have also, and it relates to your prior comments about Bill O'Riley, you certainly had a lot to say about this topic of science and religion, and I guess you could say your "Religion" is kind of that of Einstein, no God necessarily but plenty of … awe in wonder at the universe. Neil: Well, actually it's not that I have had plenty to say about science and religion. In fact that subject occupies no more than about one percent of my writings, and an even smaller percent of my public talks. What happens is these things get clipped and put on Youtube and they get reposted. If you do a search on my writings what people seem to have reacted to the most are these comments and thoughts on science and religion. They don't drive my interest in public discourse. In fact I have been invited to appear on to debate religious people on panels, I am just not interested. It's not part of my public platform to argue about religion and God or with the existence of God. I just don't have the interest in that. We have plenty of other people who do, who forge their modern careers on it, so go find them. I’d rather get people sort of thinking straight in the first place and getting them to celebrate the beauty of the universe and the laws of physics. Chris: Yes. I didn't mean to mischaracterize that. I too have seen the famous Youtube clip, which is pretty spectacular when you think of that, you and Richard Dawkins at beyond belief. It's spectacular because it's you and Richard Dawkins first of all, but it's spectacular because you represent two views on the complex debated relationship between science communication education on the one hand and criticizing religion on the other. Even if you don't want to, you end up having to be pulled into it a little. Neil: Yes, exactly. People and the association is there, and I am widely claimed by the atheist movement when in fact I don't … it's just not a part of my public persona. Quite funny, I don't know who created my wikipage, but in there a few years ago it said Neil deGrasse Tyson is an atheist who is an astrophysicist, and I said, "What, that's not really." I put in there Neil Tyson is agnostic. Then three days later it was back to atheist. It is an urge to claim me in that community. I have to put it, word it in a way that would survive an edit. I said, "Widely claimed by atheists, Tyson is actually an agnostic," and so that managed to stick. I haven’t checked it lately, but that's how I left it off. The point is if you look at the … there are people who … there are philosophers who want to debate me about my saying that I'm agnostic rather than atheist. Atheist, so we want to claim it, it's the same thing. You could read definitions of words, but at the end of the day it's how people behave, who associate themselves with those words that define what the word is. If you look at the conduct of atheist in modern times, that conduct does not represent my conduct. Pure and simple, I just don't behave that way. I don't cross off the word "God" in every dollar bill that comes to my possession, in the “In God We Trust” part. I just don't do that. There’s got to be some other word for people like me. Agnostic seems to fulfill that role. The encounter that I had with Richard Dawkins, which I think is if it's the one you are referencing, it's the most watched YouTube clip I have ever been in. It was first time I ever met him – “There’s Richard Dawkins, I have read all of his books.” The guy is brilliant, and he is Oxford trained which means he speaks well, speaks perfectly in ways that Americans can only envy. There he was, it wasn't just his written word, his spoken word was so sharp and so brilliantly barbed that it was like "Wow." If I were not as educated as I am, I would be completely turned off by the power of his capacity to communicate and leave me thinking that I am stupid. That's what led to my comments. That I thought that he did not give enough attention to thinking about what's going on in the mind of who is listening to him. Because he is not then persuading anybody, he is turning them into enemies, sworn enemies. He is so good at what he does; he is making enemies out of people rather than friends. That's what led to my rebuke of his methods and tactics in that two minute clip we are commenting on his ways. That was a Beyond Belief conference. I gave two other whole presentations at that conference. One is semiautobiographical, and another one is on intelligent design, which is on all the news at the time, because the Dover, Pennsylvania case with intelligent design in the classroom, in the public school classroom had … I don't remember if it had been resolved by then or will be certainly in the news. I just wanted to give to all these people saying, intelligent design is a separation of church and state. I just try to put a reality check on that. Intelligent design has been around for millennia. Ptolemy in the notes on his … Ptolemy is one of the great proponents of the geocentric universe, a brilliant mathematician, an Alexandrian mathematician. He wrote in the margin of his greatest tome, "When I trace at my pleasure, the windings to and fro of the heavenly bodies," he is referring to the planets going forward and then retrograding and then going back again. "When I trace at my pleasure the windings to and fro the heavenly bodies, I no longer touch earth with my feet. I stand in the presence of Zeus himself, and take my fill of ambrosia." That's a quote from one of the greatest scientist of his day, Claudius Ptolemy. It is essentially intelligent design. He doesn't really understand why the planets are doing this. He thinks he has some angle on it with every cycle and like. At the end of the day he says Zeus is Zeus, I'm basking in Zeus's handy work. We look at that poetically. We are not saying, "Get it out of the school; stop it." Look at the history of this and its there. You can't or shouldn't ignore it. The issue here is not that people think and feel that way. The issue is that it is not science. Period. Therefore it does not belong in that science classroom. Put in history class, put it in religious philosophy class or the history of philosophy class, but it never leads to discovery. That was the only point I was making. I wasn't debating the existence of God. I was simply saying it is not science. It doesn't lead to discoveries. That's the kind of way I’ve been engaged. Even that has very heavy viewership. I'd say it's one percent of my public commentary, but it's 25 percent of all the views that people have of me on Youtube clips. They think I am all about the religion-science conversation, but I am not. Chris: Well, I am glad we gave you the chance to clarify and explain that. I think one reason also that that thing got so many views is that Richard Dawkins then responds with a marvelous joke that we cannot utter on the air that people can Google … it being quite an exchange. Neil: These are not just for your listeners, it's very Googlable. By the way one other thing, a point that I don't think is addressed on this whole religiousity-God thing. There is the modern atheist describing or leaving one to feel that if you are religious that you are somehow steep in ignorance of the operations of the world in ways that these enlightened atheists are not that they are aligned and you are not. Fine, however, there is the little matter of that 40 percent or 35 percent, a third of western scientists claim a personal God to whom they pray. What does it mean to attack the public for their religious ways when members of your own community numbering albeit less than what you find in the public, but still not zero, nowhere near zero. Third is very not zero, all right? A third of your brethren, it seems to me, that should be their first target, and until that number becomes zero, they really have no, I don't see how they can justify beating the public over their head saying, they are stupid because they're religious, when a third of the scientists among their professional rank feel exactly that same way about their religious conviction. Why don't you start with the scientist and have a conversation with them first? They don't. I think the public becomes an easy target because they are not as educated as they are. I think it's pedagogically unfair to launch the movement in that way. Chris: Well, it also suggests the relationship between science, religion and literacy is not completely linear. Neil: Exactly. It's correlated, yes. The higher education level, the less likely it is that you will be religious, that's well known. The more elite you are in the scientific world, the less likely you are to be religious. These correlations are there. They don't go through the zero point, right? There is still left over folks who are highly educated, highly elite, yet still believe in a personal God. I think that's fascinating, and maybe that should be the subject of study. How is it that it could be so resistant even under the action of those forces that would otherwise remove it in others? Neil: And you mention Pluto in your book. Don't pretend like you didn't because I'm here on the phone with you now. Is it on like page one or something of the book? Chris: Exactly. You're one of the early demoters. Now, we learn that Eris, if I'm pronouncing like the rock out there whose discovery most closely triggered Pluto's changed status may not be as big as Pluto after all. Does Pluto get a do over? Neil: Yeah. If you only imagine that Pluto not being the biggest object out there, if you thought that that was the reason why Pluto was reclassified, then it's natural for you to think that oh, Pluto has regained the largest object status in the Kuiper Belt, this region is where you find all these icy bodies including Pluto. Then you'd think, yes, let's reopen the conversation. The conversation was never based on whether or not Pluto was the largest or the second largest object. It was never based on that. Its false reasoning to suggest that Eris once thought to be bigger than Pluto is now smaller and therefore Pluto is a planet. Note that the definition adopted by the international astronomical union does not rely or depend on Pluto being the biggest, the second biggest or the third biggest. It depends on, is Pluto round? Yes, okay. Put a check in that box. Has Pluto cleared its orbit gravitationally? No, it hasn't. The mass of everything else in the Kuiper Belt vastly exceeds the mass of Pluto. Pluto is in a swarm out there, so that box doesn't get a check. The classification goes from planet to dwarf planet. There is another object such as that, there is the largest asteroid. It's Ceres, and named for the Greek Goddess of harvest. The word cereal comes from that name. Ceres is large enough to be round, gravity makes you round if you have enough mass. Small objects, like the moons of Mars, look like potatoes, Idaho potatoes. They are too small for their gravity to override the structural integrity of the rocks themselves. Above a certain size everything is essentially round. Ceres is round, but hasn't cleared its orbit. It's orbiting with countless thousands of other bodies in the asteroid belt, the asteroid belt, the Kuiper Belt. The round objects in those zones are dwarf planets. Who cares if Eris is bigger or smaller. In that way, Mike Brown in his book How I Killed Pluto and Why It Had It Coming, he overstates the importance of Eris, of his discovery of Eris being bigger than Pluto as a driver for demoting Pluto. It helped to … people accept the inevitable demotion, but it's not that ,… there was a conversation in progress for decades actually well before the discovery of Eris. That's why I'm not losing sleep over Eris. Chris: Fair enough. Well, let me just ask you one concluding thought Dr. Tyson. You are probably our most prominent science communicator or at least one of them … if anyone knows what works and what doesn't it is probably you. Let me just ask you this final question, is it working? Are we getting through? Neil: If I admit that science communication is not working then what do I make of my modern life as a communicator? Let's say, I've just failed. Actually I think I am fully capable of admitting failure if in fact that's what I see happens. However, for me the signs are all good. If you look at how many twitter followers Brian Cox has in England, and how popular he is. I am told he is more popular in England than Carl Sagan ever was here in America. You look at the fact that it fluctuates, but at any given moment half of the top ten grossing movies of all time are based on science themed subjects. The biggest grossing movie of all time is Pandora, and its astrobiology, that's what that … would drive that, space exploration and astrobiology. These are all good signs. It means people are thinking about it. It means it's there. It means it's within arms reach. I'm on a landscape populated by multiple other science educators. By the way there has always been science educator journalists, yourself among them, that's been a constant over all this time from McPhee who has been … who wrote about geology. You have Dava Sobel who writes about the history of science. You have Timothy Ferriss. We have people who write about science. Another one, Michael Benson; these are people who are fundamentally journalists, but have a deep interest in science and have written books. There are many science editors who have books to their credit in an effort to bring science to the public. That has been a constant, I think. I have always been charmed by that fact. You add to that, the fact that you now have half a dozen to a dozen scientists who are visible, who are active who are themselves writing books for the general public and being interviewed on television bringing the frontier of their trade to the masses. I think that can only be a good thing. Yes, it's slow, but it's steady. I think it's real, and I think it's irreversible. If you remember Obama's inauguration speech, he mentioned science in the speech. I tried to look back at previous presidential speeches and I don't … the word science is not common in the inaugural speeches. Kennedy referenced it, but it just not … so the fact that it's there gives me further hope that it will become part of the country's agenda. There are two reasons to do it. One, because it's great to learn about how the universe works. I'm not so naïve as to think that that's going to drive congress. Well, do you know what drives congress? They don't want to die poor. The sooner people realize that innovations in science, engineering and technology and math are the engines of tomorrow's economies the sooner we will take action to remedy this problem. Administratively it's not just in terms of the pop culture venues that television and twitter streams represent. We recognize this because we are fading as the rest of the world moves forward. They are investing in their science and engineering and technologies. America, I think, tends to respond to military threats and economic threats with efficiency and with resolve more so than it responds to anybody's urge to want to explore. If it's … because we fear our economic strength will evaporate, I'll take it as a reason for studying science. Meanwhile, I'm doing it because I think it's the greatest enterprise humans have ever embarked upon. Chris: Well, Dr. Tyson, I want to thank you for a wide ranging episode and a very inspiring closing thought. It has been great to have you on Point on Inquiry. Neil: Well, thanks for this. I think it's the first time you have interviewed me, and so welcome to that post. I think it's a great way for you to spread the love. Chris: I want to thank you for listening to this episode of Point of Inquiry. 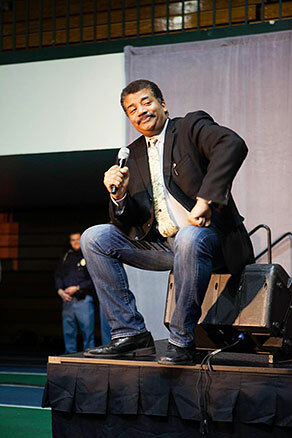 To get involved in the discussion about Neil deGrasse Tyson's views and works, please visit our online forums by going to centerforinquiry.net/forums and then clicking on Point of Inquiry. The views expressed on Point of Inquiry aren't necessarily the views of the Center for Inquiry nor of its affiliated organizations. Questions and comments on today's show can be sent to feedback at pointofinquiry.org. Point of Inquiry is produced by Adam Isaak in Amherst, New York and our music is composed by Emmy Award winning Michael Whalen. Today's show also featured contributions from Debbie Goddard. I'm your host, Chris Mooney.